This lady had a bilateral partial knee replacement, outside. She complained of pain on walking after 1 week of surgery. X ray was done, which apparently did not reveal any abnormality. 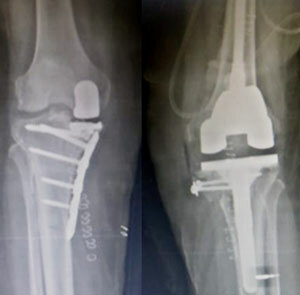 Subsequently, the pain increased and further and x-ray evaluation now revealed that there was fracture of medial condyle of tibia on both sides. One side, where the fracture was not much displaced, was fixed with a plate and screws. 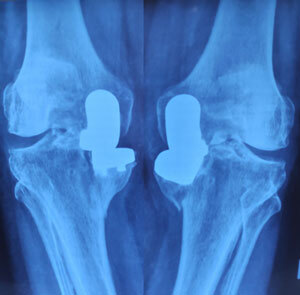 The other side fracture was badly displaced, and needed conversion to a knee replacement. Copyright © 2017 Knee & Shoulder Clinic. All rights reserved.